This handheld magnifier helps the old people or people with poor vision to read books/magazines/newspapers, or people who needs to observe small objects, such as small electronics, coin and stamp. 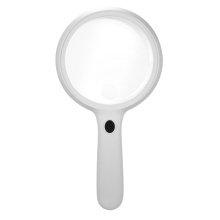 Jumbo Size Magnifying Glass – Extra Large 5.2 inch over sized handheld LED magnifying glass with 1.5X and 5X scratch-resistant high power magnifying lens. High Quality Resin Lens – Clear & distortion-free magnifying lens with comfortable ergonomic handle, suitable for children, adults, seniors, hobbyists and professionals. High Clarity LED Magnifier – Perfect for reading fine details in books, newspapers, magazines, maps, electronics, miniatures, jewelry, pill bottles, hobbies and crafts, reading the fine prints, nature exploration, coins & stamps collection, comfortable to hold and use. Lightweight Design – Nice present for the old people or people with poor vision, 14pcs annular LED light for the lens ensure better lighting effect under insufficient light or dark environments. Super Bright LED Light & Adjustable Brightness – Built-in energy-efficient LED light turns ON/OFF with a simple button switch & 2 kinds of adjustable brightness, meeting your different requirements in various occasions.